In the previous article, we looked at IF function basics. Today, it is time to look at more advanced stuff. Spoiler alert: nested formulas (aka “vnořené funkce”) included. The way how the complex formulas look makes really a difference. Notice how the brackets are used. Also notice that PSPad is counting brackets for you. When you select a bracket, it will highlight the remaining closing or opening bracket from that pair. So far, for the “then” part of the formula, we have been using a static value. If you use the “IF” wizard, you can also reference another column. Of course, you reference another column just by typing it as e. g. [Keyword]. But what if you simply want to perform an action? Assume, you want to create broad KWs out of broad match modifier KWs, i. e. you need to remove all “+” signs from the Keyword column. Now, the last formula is trickier. You are checking for keywords which do not contain “+”, hence the “not” operator. Then you need to append “+” as prefix and join it with string where you replace spaces with space and “+” sign, hence the “&” as joining character. Makes sense? Let’s take it one step further, the new Keyword you are creating needs to be all lower case. How would that look like? Notice the added Text.Lower function in order to achieve all lowercase letters. I am showing Text.Replace function in the “then” part of the formula. Frequently, you will also use Text.Start, Text.End, Text.Range or wide array of List functions (coming in a future article). By using and, or, not and brackets, you can create extremely complex if formulas. I strongly recommend using a text editor which color-codes the formula for you, especially when you are building nested formulas (the Text.Lower example). Keep in mind that if, and, or, not, then, else are always lowercase. Don’t limit yourselves with static values or column references in the “then” or “else” part of the formula. And that’s it! Don’t be scared and try yourself ? Thanks for your great post. it is very useful to me……. You are welcomed, you can see it is not that difficult. Probably eaiser than standard Excel. Simplemente genial gracias por cmpartir! How I can return what I found? Sorry, can you pls be more specific? I’ve wrote the above formula in normal excel style, pls can help me the syntax for Power query? 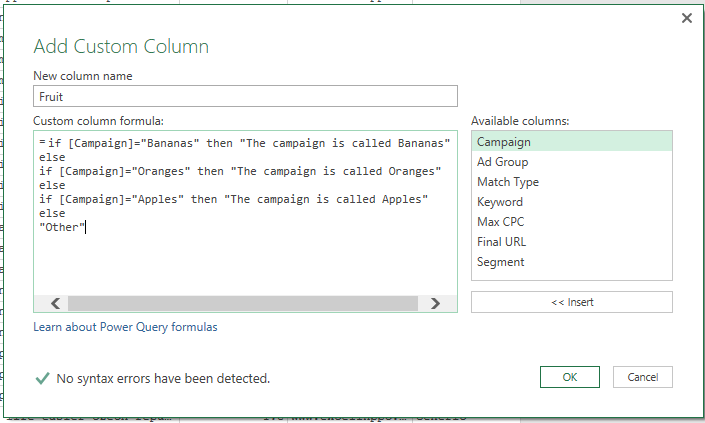 Having Troubles with Setting Up Your PPC Reporting Architecture?